Oh the days when I was a kid and mum would make me a big stack of fluffy pancakes on a Sunday morning... there was nothing better. I think it's very important to still be able to enjoy the comforting foods that you love but twist them so that they are nutritious, healthy and weight loss friendly. 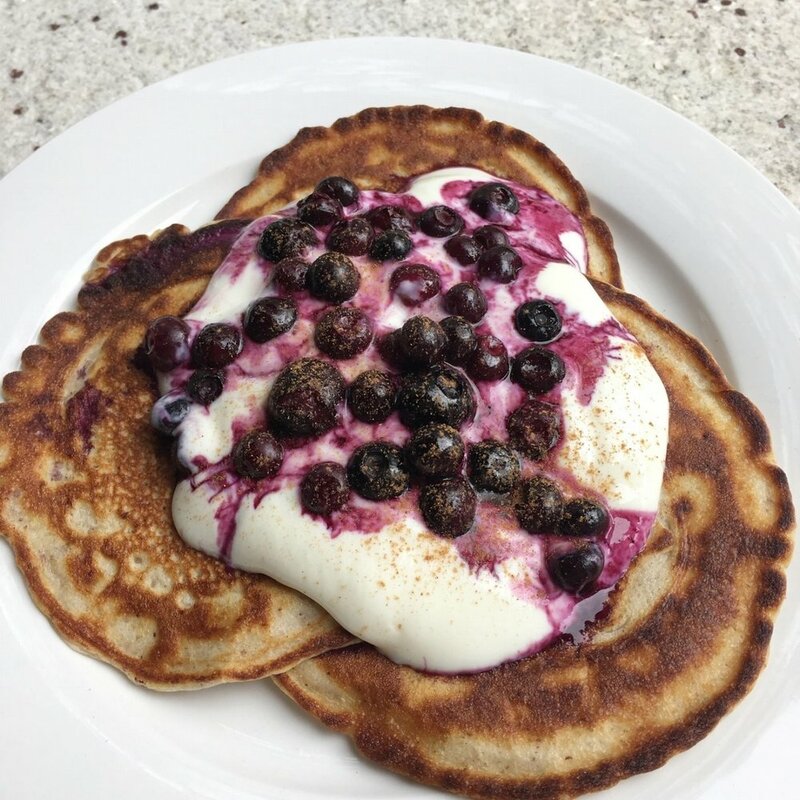 So, I have worked out a recipe that I will share with you here for a healthy alternative to the regular, white flour, high sugar pancakes! The importance of swapping highly refined carbohydrates (in this case white flour) to a protein source along with good fats is what I always bang on about. What it means is that the meal is digested slower, you are fuller for a much longer period of time, your blood sugars remain stable, and your cravings for food are diminished. When all of these things work together, over-all calorie intake for the day is naturally decreased and your energy is stabilised throughout the day instead of those constant highs and lows. Highly refined carbohydrates are also simply just not healthy. They come along with zero nutrients so they just provide you with calories and that is it. Some great low carb, high protein substitutes for flour are coconut flour and almond meal. These are the two ingredients that I swap flour for when I feel like baking. These beautiful pancakes are high in protein and low carb so they will do to your body exactly what I just said above. Actually, if you have them for brunch I think you would be set till dinner! Absolutely perfect for a weekend breakfast/brunch when you have the time to play around in the kitchen. They are very easy and quick to prepare (like all of my cooking) and taste absolutely insane. Use a 1/3 cup measure to scoop out some batter and pour onto pan. Cook for about 2 minutes or until you see some bubbles start to form then flip! Repeat this 3 times for 3 perfect pancakes! Serve with yogurt and blueberries. Sprinkle with extra cinnamon!